Surprising facts and stats about leaders and derailment. Three root causes why leaders can get derailed. Areas that can help a successful leader who are stuck, get back on track. What leaders who are known for leading innovative teams do very well. What true confidence in a leader looks like and acts like. Valuable, practical tips and ideas to help leaders demonstrate confidence AND humility. Director of Research and Assessment for Bates. In his role as a certified BatesExPI™ feedback provider, he offers coaching and assessment interpretation to senior leaders and executives. Michael believes that coaching provides leaders with the one critical thing highly successful and powerful executives rarely get - the truth about the impact of their behavior on others.He learned this early in his career when he was the full-time trusted advisor (coach) to the CEO of a major hospital. Since then, he has used this philosophyto coach over 900 senior executivesat numerous companies and organizations such as ARAMARK, BASF Corporation, JP Morgan Chase, Johnson & Johnson, J&J/Merck, Lockheed Martin, Pfizer, State Street, TD Ameritrade, Unisys, andVerizon. Prior to joining Bates, Michael operated a successful firm specializing in executive education, executive coaching and executive team development. At RHR, he developed a unique approach to executive development that combined workshops, coaching and action learning projects. This work has been recognized by The Wall Street Journal, The New York Times, the Financial Times, USA Today, The Globe & Mail and the Los Angeles Business Journal. He used this approach to develop programs for ABInBev, ARAMARK, Best Buy, Darden Restaurants, Kraft, McCormick, Merck, Northern Trust, Pepsi Bottling Group, Steelcase, Swisscom, and US Foodservice. Prior to working at RHR, for nine years he was the Director of Program Development at the Wharton School's Aresty Institute of Executive Education. He designed customized programs for over sixty clients including DuPont, IBM, KPMG, General Motors, Unisys, and Verizon. Michael received his Bachelor of Arts Degree from Trinity College and Doctorate in adult education, group dynamics and organizational development from Temple University. Topic 1: Getting to know Michael. Favorite possession – Bottle collection. Topic 2: Leaders and derailment. Derailment – Costs to the company, percentage of managers/executives who are engaged. Derailment can cost an organization more than 20 times an executive’s salary, in some cases amounting to millions of dollars. Not great at engaging people and getting them involved. Only 34% of managers and executives are engaged. Don’t feel appreciated, too much going on, unclear roles and responsibilities, too much change and uncertainty. How leadership is changing/transitioning. 60% of all companies cite “leadership gaps” as their top business challenge. Topic 3: Warning signs of derailment. Look for distress, it doesn’t have to be big things, look for little things too (i.e. being short or frazzled). There is too much to do and the pressure of getting it done is too much. Viscous cycle: Doing things without explaining why you are doing them, leaves your team confused. Topic 4: How confidence can cause derailment. CFO example - Having too much confidence. Take the time to slow down, engage and involve others. Topic 5: Root causes of derailment. Gap between your intentions and other people’s perceptions. Story – Moving from HR Manager to the right-hand man of the CEO. Topic 6: Top areas (facets) that are seen most often to cause an executive to start going off-track. What challenges are being faced? Bank teller to 2nd in charge of one of the largest financial firms in the world. Imposter syndrome. 80% of people experience the imposter syndrome. Why it is healthy. Give people permission to take a reasonable risk. Have a good clean fight! Balancing confidence and humility. Be high in both! Don’t lower anything, raise your other facets. Advice you would give your 25-30 year old self about executive presence and leadership: Watch more closely how people react to what a leader says or does. 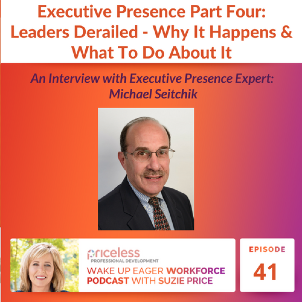 One bit of advice you would like every leader to take away from our discussion about confidence, executive presence and derailment: You always have the choice of changing how you show up; your presence, your leadership, how people perceive you. Your behaviors can change. Suzanne Bates Books "All the Leader You Can Be, the Science of Achieving Extraordinary Executive Presence." Get a complimentary copy with a 30 day trail with this audible link HERE. How Priceless Professional Development Coaches Senior Leaders and High Potentials - The Executive Presence Index...link HERE.